When I was a child I was intrigued by the descriptions I overheard my parents using when they discussed people they knew. I didn’t quite understand them in those days, but of course began to grasp their meanings as I too encountered similar people. One of them I remember my mother saying about an acquaintance was, “She does everything by the book!” She was not talking about the Bible, but this lady’s own unwritten code of behaviour, and woe betide anyone who broke those rules that this lady thought were good and proper. My father had another fascinating observation about a neighbour, “He doesn’t suffer fools gladly.” and yet another, “He won’t give an inch if he thinks he is in the right.” This terrible rule setting for others, sadly, still exists today and was very evident when Jesus encountered the teachers of the law and the Pharisees as he strove to show them the power of love over the law. Probably the best example of Jesus’ overturning the rigid, hypocritical, crushing approach the Pharisees had to God’s law, was his encounter with the woman caught in adultery. The Pharisees wanted to see if Jesus would condone stoning her for her sin, even though they themselves were bending the law, as the man involved in this sin should also have been judged just as harshly, (Deuteronomy 22:22). Filled with self-righteousness and wanting to trick Jesus, they are startled by Jesus response to their questioning. Instead of entering into heated arguing about what is right, he challenges them to search themselves, to look honestly at the wrong doings they had committed to see if they too were guilty of breaking the law. He challenged them to put themselves in another’s place, to temper justice with mercy and slowly they slip away his words touching their hearts. When love triumphs over law, God’s richest blessings flow. Such a good reminder Jo about not expecting others to act to our standards! 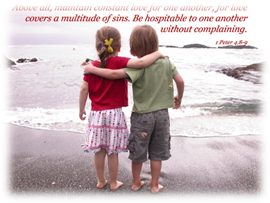 As Peter wrote ,Above all, love each other deeply,because love covers over a multitude of sins. Thank you Jo ! Thank you Jo. It is so easy to criticise anyone who has different views from ours. 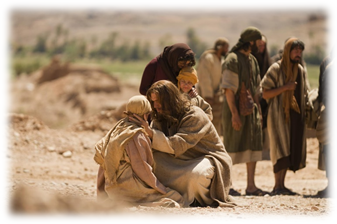 The only one there “without sin” was Jesus himself – and he did not stone her! Your quote from Peter, Jo, truly sums it all up. Thank you again.